Objective: Artificial insemination (AI) has been used to treat infertile couples for approximately 200 years. Time interval between administration of Human Chorionic Gonadotropin (HCG) and intrauterine insemination (IUI) is one of controversial subjects in AI. Fertility rate is in the highest level on the day before ovulation. The aim of study is to compare pregnancy rate in standard IUI versus simultaneous HCG administration with IUI. Materials and Methods: In a randomized, controlled clinical trial, 141 women 20-35 years selected for IUI among patients referring to infertility clinic of Al-Zahra hospital in Tabriz, Iran in 2013.they were entered into study in two groups of simultaneous (n= 71) and standard (n = 70). After ovulation stimulation by clomiphene and human menopausal gonadotropin (HMG) and creating up to 3 dominant follicles in each patient, a single dose of HCG was administered; thereafter, IUI was done in the simultaneous group instantly and 34-40 hours following HCG injection in the standard group. 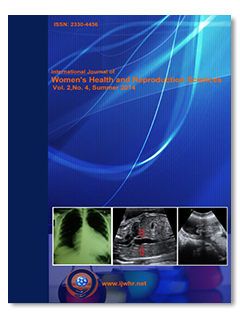 Results: In the standard and simultaneous groups, mean pregnancy rate per patient was 25.7% and 21.1% respectively (p= 0.52) and pregnancy rate per IUI cycle was 16.4% and 15.3% respectively (p= 0.82) that was not significantly different. Furthermore, between two groups in terms of age, the number of mature follicles, and endometrial thickness, there was no significant difference. Conclusion: Although difference in pregnancy rate between two groups was not statistically significant, simultaneous HCG with IUI is a comfort method for patients due to less cost and fewer patient's referrals to clinic.